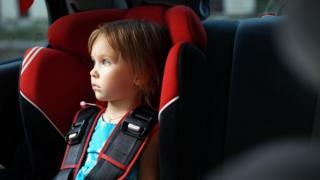 Child car seats: Will you be affected by rule changes? New rules on child car seats are set to come into force after March next year and have left many parents confused about what they need to use. Changes are being made to the weight and height at which a child will be allowed to use a backless booster seat. However, parents will not need to replace car seats they have already bought because they can continue to use them. From next year, changes are being made on the rules regarding backless booster seats. Currently, parents can use these types of seats for children who weigh 15kg (2st 5lbs) and above - typically aged three and over. The new rules will mean only children weighing over 22kg (3st 7lbs) who are also over 125cm (4ft 1ins) tall can use the seats. The United Nations, which sets the safety standards for car seats, has approved the change which must now be implemented by the EU. The government said the earliest the new rules will come in is March 2017 and they will affect the whole of the UK. Why bring in the new rules? Many child car seat experts say they are unsuitable for small children as the child is not held as securely in the seat, the adult seatbelt is not guided across their body in the best way and they offer little protection if a car is involved in a side-on crash. What if you have already bought one? Do not worry. The changes will only apply to new backless seats and not ones already on the market that meet current safety standards. Parents can continue to use their current model after the rule change and will not need to buy a new one. It will be down to manufacturers of new seats to ensure they meet the revised safety standards and are labelled correctly. Children must use a child car seat until they are 12 years old or 135cm (4ft 5in) tall, whichever comes first. Only EU-approved child car seats can be used in the UK - which have a label showing a capital "E" in a circle. Parents should typically choose a car seat based on their child's height or weight. A driver can be fined up to £500 if a child under 14 does not wear a seat belt or child restraint. Anyone 14 and over not wearing a seat belt must pay the fine themselves. There are exceptions. For example, children can travel without a child car seat in a taxi or minicab if they travel on a rear seat and wear an adult seat belt if they are aged three or older or without a seat belt if they are under three. Which seat should you have? Many parents think they can judge which car seat they need to buy based on their child's age but it should only be used as guidance. Car seats are typically categorised according to height and weight. Height-based car seats, known as "i-Size" seats, must be rear-facing until the child is over 15 months old. For weight-based car seats, the type depends on how heavy a child is. 0kg to 9kg (1st 6lbs) - A lie-flat baby carrier, a rear-facing baby carrier or rear-facing baby seat using a harness.